May 13, 2016 Sächsische Schweiz The adventurous cyclist, Claudia, and I decided to cycle together towards Prague this day, but I definitely wanted to ride up the 20 something kilometers to the famous rock formations of the Saxonian Swiss Alps. So I set off at 7 for a long hike up. The hills were was steep and long, at times at 12 and 13 percent ... Finally up over the river Elbe, I was rewarded with a wonderful and world famous view of the rocks (interestingly in private ownership). 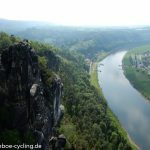 At 1 pm I was back down on the river side and Claudia and I set off along the Elbe cycle trail for the Czech Republic and in the direction of Prague. However, a torrential rain soon stopped us and we checked into a hotel in Decin. By coincidence, we came onto this years town festivity and watched a very impressive fireworks. We stood on the bridge over the river with what seemed 100 percent of the town's population and when the lights were turned off and the fireworks began everyone seemed stunned and in awe and it really was very beautiful. Auch eine Deutschlandtour ist lohnenswert – wie man sieht. Beeindruckende Photos.